We're so pleased to have met and worked with many wonderful vendors that give back and have a true calling in what they do. We'll be highlighting a different vendor/small business owner each month on the blog, and we are so excited to start with Elise from Little Lunch Maker. We were blessed to meet her through a mutual Instagram friend, and it's been fun and faith boosting, following each others journeys over the past year. As you'll find out, Elise has the kindest heart and makes the most beautiful prints and art work. She is uplifting and encouraging, and even though we haven't had the pleasure to meet in person, you can feel her kindness and God love through her writing and messages. We're so happy to interview her today for our first spotlight, and we hope you enjoy getting to know her (and her business) just a little bit more! Please tell us a little about yourself and your tribe! Hi! I’m Elise. I am married to my best friend and super-supportive business partner, Jason. Somehow we keep our 5 exuberant kids alive (and fed!). They are so loud, y’all. They train us in character development every day and we are trying to return the blessing! We attempt to throw homeschooling in the mix. I am the oldest girl of 9 children, and my husband is an only child. We are currently working towards traveling the U.S. in our tiny home (a 5th wheel RV my super-skilled DIY husband is renovating from top to bottom!). How did you start your blog and online shop "Little Lunch Maker"? Like God so often does - He used a crisis to pivot the direction my family was heading about 3 years ago. My husband’s dad had Alzheimer’s disease for nearly a decade, and in the fall of 2014 his dementia took a downturn that required full-time care. After much prayer we felt God wanted Jason to quit his full-time job, and all of us move into his parent’s house to be live-in caretakers for his dad, and a support for his mom. Starting the Little Lunch Maker shop was the idea God gave me to earn income from home while still doing what I love: sharing about Him and strengthening people to obey and trust Him. What fuels your passion and inspires your creativity? I’m not trying to give a stock answer... But what really fuels my passion is this: I want to others to know Jesus more and more. I want to share everything I know of Him. He is my joy and sanity. He is my passion, and He inspires my creativity. I am never discouraged when my eyes are fixed on Him. Every creative work I have ever put into the world has come directly out of my time and relationship with Him. He gives me some truth + hope + grace… and I try to stuff it into lines, curves, colors, gold foil and the English language. What have you learned so far in business/creativity that you can share with others? Prayer is the foundation of everything successful - including business. Because God’s voice has got to be the loudest and clearest in my mind and heart so I know what step to take next. Or I will get jerked around and overwhelmed by all the great ideas/online courses/opinions/methods out there. Emily Ley’s Playbook website. Her masterclasses are like one-on-one brand and business coaching you can revisit over and over. 100% worth the price. Stu McLaren’s TRIBE course (I’m developing an online course right now). If you are interested in creating a membership site, and online course, or some other recurring digital content for income then I highly recommend Stu’s course. He shares so generously from his vast experience with membership sites! Beth Anne from Brilliant Business Moms is another favorite I have to recommend. Her posts are so practical and encouraging! And if you have a business question? Email her team and ask! They really will answer. (Find this email address at the end of her “about” page). What is one thing that has happened to you, that has made you a stronger person? Moving in with my mother-in-law to care for my father-in-law. Giving up my own safe, comfortable “home base” and space. This move happened about a year after finding out one of my little girls had been abused - so there were major emotional, mental, spiritual struggles already going on. Trying to raise and spiritually support 5 kids, homeschool, and work from home in my mother-in-law’s home while caring for my father-in-law with dementia is one of the hardest things I’ve ever done. It painfully exposed everything I cannot control, everything I do not have “together”. And I’ve done some hard things (single motherhood, natural childbirth etc.). But - because God is determined that our strength should be drawn from Him alone - He needed to strip away everything else I thought was solid ground for my feet. He pried open my desire to control my circumstances and how others perceive me one stubborn finger at a time. Now I try to keep my hands/my circumstances wide open to Him and my feet on the Rock. He has made me stronger and more joy-filled than I ever hoped or asked for. I trust He will continue. I’m going to need it. Hope Himself poured into me through the Holy Spirit. These aren’t just words. This is my life experience. When I am full of Him - I am full of Hope. I want *everyone* to have this unshakable Hope, too. He’s the best. Ever. Come connect with me at littlelunchmaker.com! If you want to strengthen your faith, I’d be honored to run a bit of this race with you and cheer you on at the top of my totally-unashamed lungs! You can also find me on Instagram! Isn't she lovely? Thank you Elise for spending time with us today. Your words, advice and business tips are immensely helpful! With that said, we're doing a little giveaway with Elise, and we're so excited! 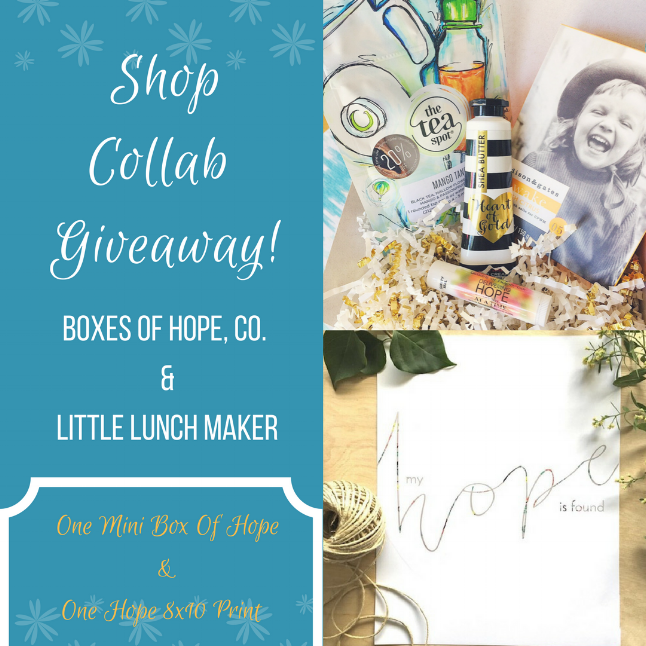 We'll be giving away one of our Mini Boxes of Hope (something new we're trying out!) and 1 8x10 Hope print from Elise's shop, to one lucky winner! That's it! Super easy. We look forward to connecting with you all and can't wait to find out who our winner is. Winner will be announced Tuesday, June 27th!